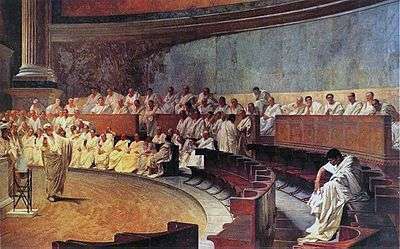 The Roman orator Cicero speaks to the Roman Senate. Public speaking (sometimes termed oratory or oration) is the process or act of performing a presentation (a speech) focused around an individual's direct speech to a live audience in a structured, deliberate manner in order to inform, influence, or entertain them. Public speaking is commonly understood as the formal, face-to-face talking of a single person to a group of listeners. It is closely allied to "presenting", although the latter is more often associated with commercial activity. There are three general purposes of public speaking: to inform, to persuade, and to entertain. In public speaking, as in any form of communication, there are five basic elements often expressed as: "who is saying what to whom using what medium with what effects?". 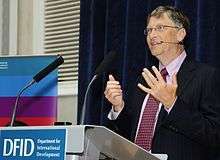 The purpose of public speaking can range from transmitting information or telling a story to motivating people to act. Good orators should not only be able to engage their audience, but also be able to read them. The power of a truly great public speaker is the ability to change the emotions of their listeners, not just to inform them. Public speaking can also be considered a discourse community. Interpersonal communication and public speaking have several components that embrace such things as motivational speaking, leadership/personal development, business, customer service, large group communication, and mass communication. Public speaking can be a powerful tool to use for purposes such as motivation, influence, persuasion, informing, or simply ethos. In current times, public speaking for business and commercial events is often done by professionals, with speakers contracted either independently, through representation by a speakers bureau paid on commission of 25–30%, or via other means. It is believed 70% of jobs today involve some form of public speaking. Early training in public speaking took place in ancient Egypt. The first known Greek work on oratory, written over 2000 years ago, elaborated on principles drawn from the practices and experiences of orators in the ancient Greek city-states. In classical Greece and Rome, the main component was rhetoric (that is, composition and delivery of speeches), which was an important skill in both public and private life. Aristotle and Quintilian discussed oratory, and the subject, with definitive rules and models, was emphasized as a part of a liberal arts education during the Middle Ages and Renaissance. The art of public speaking was first developed by the ancient Greeks. Greek oration is known from the works of classical antiquity. Greek orators spoke on their own behalf rather than on behalf of representatives of either a client or a constituency, and so any citizen who wished to succeed in court, in politics, or in social life had to learn techniques of public speaking. These skills were taught first by a group of self-styled "sophists" who were known to charge fees to "make the weaker argument the stronger," and to make their students "better" through instruction in excellence. Plato, Aristotle, and Socrates all developed theories of public speaking in opposition to the Sophists, and their ideas took on institutional form through the development of permanent schools where public speaking was taught. Though Greece eventually lost political sovereignty, the Greek culture of training in public speaking was adopted virtually wholesale by the Romans. With the political rise of the Roman Republic, Roman orators copied and modified Greek techniques of public speaking. Under Roman influence, instruction in rhetoric developed into a full curriculum including instruction in grammar (study of the poets), preliminary exercises (progymnasmata), and preparation of public speeches (declamation) in both forensic and deliberative genres. The Latin style was heavily influenced by Cicero, and involved a strong emphasis on a broad education in all areas of humanistic study in the liberal arts (including philosophy), as well as on the use of wit and humor, on appeal to the listener's emotions, and on digressions (often used to explore general themes related to the specific topic of the speech). Oratory in the Roman empire, though less central to political life than in the days of the Republic, remained important in law, and became (under the second Sophistic) an important form of entertainment, with famous orators or declaimers gaining great wealth and prestige for their skills. This Latin style was the primary form of oration in the world until the beginning of the 20th century. After World War II there began a gradual deprecation of the Latin style of oration. With the rise of the scientific method and the emphasis on a "plain" style of speaking and writing, even formal oratory has become less polished and ornate than in the Classical period, though politicians today can still make or break their careers on the basis of a successful, or unsuccessful, speech. Some of the greatest examples of public speaking are well known and have been studied years after the speech was delivered. Examples are Pericles' funeral oration in 427 B.C.E. over the dead of the Peloponnesian War; Abraham Lincoln's Gettysburg Address in 1863, soon after Sojourner Truth's identification of racial problem in "Ain't I a Woman? "; and Mahatma Gandhi's message of nonviolent resistance in India, inspiring Martin Luther King, Jr.'s "I Have a Dream" speech at the Washington Monument in 1963. Leaders such as Martin Luther King, Jr. and Winston Churchill are notable examples of effective orators who used oratory to have a significant impact on society. The objectives of a public speaker's presentation can range from simply transmitting information, to motivating people to act, to simply telling a story. Professional public speakers often engage in ongoing training and education to refine their craft. This may include seeking guidance to improve their speaking skills—such as learning better storytelling techniques, for example, or learning how to effectively use humour as a communication tool—as well as continuous research in their topic area of focus. Public speaking will happen naturally over a period of time as long as your willing to take on the challenge. People who are experienced in public speaking often share with us their tips and how they face this challenge. People tend to listen to their strategies and try to imitate their techniques, however this is not effective as everyone is different and deal with situations differently. According to professionals, great public speaking comes from the heart, by manipulating them into believing what you are saying. Breathe in and out meditatively to reduce the overwhelm. Include humour to disarm the tension within the audience towards the subject, but avoid using offensive jokes or corny puns. Drink water to avoid getting a dry mouth from adrenalin and eat before speaking to help reduce anxiety. Be consistent with the topic and its content; don't commit to public speaking with the intent to meander. Try to finish the speech strongly. Try to be authentic; it's what people respond to. Keep a backup plan like notes or scripts if the presentation technology goes wrong. Avoid attempts to get applause because it can be quickly identified by the audience as aversive. "It is not about the speaker, but the idea the speaker is passionate about and it is to be on service of that idea." Public speaking training centers promote the idea of adapting certain life-stances for becoming a growing orator. These life-stances are called the 12E life stances. Exchange Let go of small conveniences as an exchange for greater good. Exercise Exercise skills and widen the depth of information to address areas. Express Express one's belief in their dream through integrity in oration. Expect Expect oppositions and failure. Expose Expose one's way of working (ability in oration) and use opportunities for it. Extract Extract and personalize every positive principles and knowledge. Exclude Exclude negative thinkers that opposes orator's ambition. Exceed Exceed normal exceptions through review and restructuring. Exhibit Exhibit confidence in your objective and areas of oration. Explore Explore all possibilities and different fields of oration. Extend Extend a helping hand to those in the field of oration. A common fear of public speaking is called glossophobia (or, informally, "stage fright"). This state of response by many beginners can be confused with normal nerves as opposed to being recognised as anxiety with a genuine phobia. Clubs such as National Speakers Association, Rostrum, Toastmasters International, Association of Speakers Clubs (ASC), Speaking Circles, and POWERtalk International provide forums for members to develop public speaking skills through practice and assigned exercises in order to tackle commonly faced obstacles, like glossophobia, effectively. The technology and the methods of this form of communication have traditionally been through oratory structure and rely on an audience. However, as societies and cultures evolved over time, the tools used in public speaking have undergone some modifications. New advances in technology have allowed for more sophisticated communication for speakers and public orators. Rostrums hold papers for speakers. For large assemblies, the speaker can speak with the aid of a public address system or microphone and loudspeaker. Public speakers may also use audience response systems. Today, the technological and media sources that assist the public-speaking atmosphere include both videoconferencing and telecommunications. Videoconferencing is one of the more recent technologies that is revolutionising the way public speakers communicate to the masses. David M. Fetterman of Stanford University wrote in his 1997 article Videoconferencing over the Internet: "Videoconferencing technology allows geographically disparate parties to hear and see each other usually through satellite or telephone communication systems." This technology is helpful for large conference meetings and face-to-face communication contexts, and is becoming more widespread across the world. The use of head-mounted displays such as Google Cardboard, a virtual reality platform in which users immerse in a variety of realistic environments and can train accordingly, is a new resource in used public speaking. The National Communication Association (NCA) exists to assist professional communicators – both marketplace and academic. At the annual convention, many presentations address concerns central to effective public speaking. The National Speakers Association (NSA) is a professional speakers' organisation that supports the pursuit of public speaking as a business. The organisation's website says NSA provides "resources and education designed to advance the skills, integrity, and values of its members and the speaking profession". Toastmasters International, Rostrum Australia, Association of Speakers Clubs (ASC) and POWERtalk International are nonprofit educational organisations that operate clubs worldwide for the purpose of helping members improve their communication, public speaking and leadership skills. Through their member clubs, organisations like these help people learn the arts of speaking, listening, and thinking. The Sikh Youth Alliance of North America organised the annual Sikh Youth Symposium, a public speaking competition for Sikh youth to foster the rise of the next generation of Sikh leaders. The National Forensic Association (NFA), American Forensics Association (AFA), and Phi Rho Pi are three national organisations in the United States that sponsor competitive public speaking at the undergraduate level. Events in the three organisations fall into four categories: Public Address, Limited Preparation, Interpretation, and Debate. The Public Address events include Informative Speaking, Persuasive Speaking, Rhetorical Criticism (also known at Communication Analysis), and After Dinner Speaking; the Limited Preparation events include Impromptu Speaking and Extemporaneous Speaking; and the interpretation events include Poetry, Prose, Dramatic Interpretation, Dramatic Duo Interpretation (in which at least one dramatic piece is presented by two speakers working together), and Programmed Oral Interpretation (in which speakers use material from multiple genres with a common theme). The Debate events include Lincoln-Douglas Debate, Policy Debate, and Parliamentary Debate. The International Forensics Association (IFA) is an American body whose competitors hail from colleges and universities within the United States. The use of public speaking in the form of oral presentations is common in higher education, and it is increasingly recognised as a means of assessment. The National Forensic League (NFL) is an organisation with a similar structure and purpose to the NFA and AFA, but serves as the national organisation within the United States for competitors in high school. For Public Address, the NFL sponsors Original Oratory and Expository. Extemporaneous speaking is split into two events, International (Foreign) Extemp, and United States (Domestic) Extemp, and Extemp Commentary is offered at the national tournament as a supplemental event, while Impromptu Speaking and Storytelling are offered limited preparation consolatory events. In addition to the interpretation events offered by NFA and AFA, the NFL also sponsors Humorous Interpretation. The debate formats sponsored by the NFL include Policy Debate (Cross-Examination), Lincoln-Douglas Debate, Public Forum Debate, and Student Congress. The National Catholic Forensics League (NCFL) is an organisation with a similar structure and purpose as the NFL, however it is a national competition between Catholic high schools in the United States. In recent years, the NCFL has allowed public high schools to also complete. Stoa, NCFCA, and a number of other organisations serve the growing home school forensics community. Several states also have state and local organizations generally unaffiliated with the two national leagues. These organizations frequently offer additional events which are unavailable within either the NFL or NCFL. Rostrum Australia’s Student Development Program for Secondary School Students contributes to the welfare and personal growth of Australian Youth through the conduct of the annual Rostrum Voice of Youth Student Development Program and Speaking Competition. Rostrum has organized this competition since 1975. Rostrum Voice of Youth is open to all high school students. It involves a prepared speech and an impromptu speech. ↑ "General Purposes of Speaking". 2012books.lardbucket.org. Retrieved 2016-11-04. ↑ Zakahi, Walter (1988). "Communication Education". West Virginia: Speech Communication Press. ↑ Weiss, Alan (1997). Money Talks. McGraw-HIll. ↑ Schreiber, Lisa. Introduction to Public Speaking. ↑ Womack, Morris M.; Bernstein, Elinor (1990). Speech for foreign students. C.C. Thomas. p. 140. ISBN 978-0-398-05699-5. Retrieved 2011-12-08. Some of the earliest written records of training in public speaking may be traced to ancient Egypt. ↑ Murphy, James.J. "Demosthenes - greatest Greek orator". Encyclopedia Britannica. Retrieved 2 December 2016. ↑ "origins of public speaking" (PDF). publicspeakingproject. ↑ German, Kathleen M. (2010). Principles of Public Speaking. Boston: Allyn & Bacon. p. 6. ISBN 978-0-205-65396-6. ↑ Lloyd-Hughes, Sarah (2013). How to be brilliant at public speaking. Pearson UK, 2013. p. 4. ISBN 978-0273755210. ↑ Anderson, Chris (3 May 2016). "TED Talks: The official TED guide to public speaking". Headline – via Google Books. ↑ "Public speaking with virtual reality headset". VirtualSpeech. ↑ Mark Lewis (2010-02-16). "Podium Dreams". Forbes.com. Retrieved 3 December 2010. ↑ "National Speakers Association (NSA)". Retrieved 23 April 2015. ↑ D. G. Mallet (2007). "Authentic Assessment for Advanced Undergraduate Students". p. 14. Retrieved November 24, 2015. ↑ Falchikov, N. (2015). Improving Assessment through Student Involvement. Routledge. ISBN 0-415-30821-6. ↑ Kahl, David (2014). "High School Public Speaking Curriculum: Assessment Through Student Voice". Qualitative Research Reports in Communication: 51–58. Wikimedia Commons has media related to Public speaking.